It is on record that Mwalimu began thinking Socialism during his student days in Britain. He is quoted saying: “It would be surprising to find a progressive student in those days who did not think in terms of Socialism”. But Mwalimu was not a Marxist, partly because Karl Marx was influenced by Darwinist racist theories that relegated African peoples to second-rate human beings. He also did not import European Socialism because it derived its arguments from class conflicts. Mwalimu’s argument for African Socialism was summed up thus: “For a Third World country, once you have accepted the idea of Socialism, there is a problem of succumbing to the ideology of evolution. Marx says backward countries go through stages of development, with one stage leading to the other, and socialism is the product of developed capitalism”. He goes on: “But it is very difficult for an intellectual to say I’ll engage myself in building capitalism in order to later go on to Socialism. So I felt we really have no choice at all if we are going to try and build socialism, we have to begin where we are…. And where we are is underdevelopment, not capitalism”. 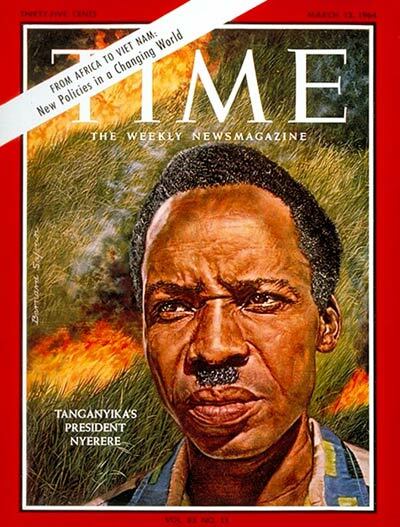 When it came to applying African Socialism (Ujamaa) in Tanzania he says: “Although people wouldn’t believe it, we did not abolish capitalism. We gave it a less of a go-there wasn’t much capital around….In the meantime we have some African capitalists, actually we have what the Chinese call “nationalist capitalists” – sort of natural capitalists, although it is very difficult for them to survive without the tentacles of the transnationals”. In the beginning, Mwalimu deliberately kept ideology out of the process of building TANU as a nationalist movement: “I thought if we get involved in ideologies, we’ll divide the people. I wanted to get rid of the British. That was far more important than thinking capitalism versus socialism”. Mwalimu says the opportunity to formulate the socialist vision for Tanzania arose out of the need to solve a practical problem of social justice: “Before independence, the British used to give loans to the colonial officers to buy cars, but only to white staff. After independence, there was a lot of pressure on me to give car loans. I said no, but I’ll give loans to build houses. Later the facility was extended to politicians. One of them was my brother; he had built one house and was in the process of building another. I thought to myself they cannot do this, these fellows are becoming businessmen, simply selling houses…. So I thought I should produce a series of articles on self-reliance”. Out of Mwalimu’s deliberations came “The Arusha Declaration for Self-reliance”, which he admits summarises the vision of the Tanzanian society which he wanted to build: “That was one of the best things we’ve ever done for this country. It gave clarity to what we were trying to do. People may now want to oppose it, they can oppose it. But they know what they are opposing”. Several years before retirement, Mwalimu was asked for what he would best like to be remembered by his countrymen; his answer was: “For trying”. As to the validity and relevance of the Declaration he said: “In the basic things, I would not change a thing. I do not think I would change the Arusha Declaration; with hindsight I would try to implement it differently, possibly in two areas”. About nationalization, he said he would have nationalized carefully, or taken joint venture with the owners, rather than nationalize outright. On rural policies, Mwalimu said, he would have turned down “Siasa ni Kilimo” (Agriculture is politics), the rallying cry of the Iringa Declaration that led to the not so popular “Villagisation”; Mwalimu laments: “I would have emphasized the family but encouraged the people to work together. We wasted too much energy trying to develop communal farming. We could have been more relaxed about it….. But the object would have been exactly the same”. On the demise of the defunct East African Community in 1977, Mwalimu reveals that he had prior warned President Jomo Kenyatta of Kenya about the intrigues by the people around him. “But your people are destroying the Community”, he had told him. He notes that Jomo was committed to the Community, but he had some narrow-minded people around him. He personally traces the cause of the Community’s collapse to Kenyans’ resentment of a strong fraternity between himself, Milton Obote of Uganda and Kenneth Kaunda of Zambia. He says: “Some fellows in Kenya felt isolated, and when I tried to get Zambia into the Community they felt it would become three to one. But they got it all wrong”. Mwalimu reveals further that in any case the Community would have survived had it not been for the “chaotic situation in Uganda with Idi Amin there…. Tanzania and Uganda would have continued the Community, which would have meant not a breaking but withdrawal by Kenya; and Kenya would have not withdrawn”. The other possible reason of the Community’s collapse was capitalist Kenya’s resentment of Tanzanian socialism: “But I said this to them, and I will say it again; I am much more an African nationalist than a socialist. The priority for Africa is not socialism; the priority for Africa is development and unity. I would rather have a united capitalist Africa than a bunch of non-viable little things under socialism. Over that I was absolutely clear”, he clarifies. Mwalimu admits that he may have been resented because he had been vocal about his vision: “Some times when you are more vocal you anger more people. So I annoyed more people than those who were not active….and therefore I was more disappointed”. Throughout his political life, the organization of the Party was at the top of Mwalimu’s personal agenda, beginning with the drafting of the original TANU Constitution (based on CCP in Ghana, extracted from George Padmore’s Ghana Revolution), his resignation as Prime Minister soon after independence to re-organize the TANU, and finally the formation of the Chama cha Mapinduzi (CCM) to accommodate the politics of the Union with the island of Zanzibar, for which he remained Chairman for a couple of years after retiring as President. Was Mwalimu ever against the multi-party system? He replies in the negative: “No! No! I was politically brought up by the British and I never saw anything wrong with the parliamentary system”. The historical fact is that, the earlier post-independence elections were multi-Party. It is also true that, Mwalimu’s democratic sensibility was unhappy with the success of TANU as a result of which opposition parties were annihilated to such an extent that up to 80 per cent of TANU candidates were being returned un-opposed. Although he was ideologically a one-party man, Mwalimu was not ideologically opposed to multi-party system. It was Mwalimu who lifted the lid off the debate on multi-partism in Tanzania: ”Ideologically I’m a socialist. Ideologically I’m a one-party man. But I have introduced the debate on multipartyism because the idea that it is taboo to question our constitution is undemocratic…. I mean I cannot accept this”, Mwalimu pointed out.